Ce bâtiment de condo d'une chambre face à l'océan, construit en 2015 est un jet de pierre de belle plage Hampton. Profitez de feux d'artifice depuis le balcon tous les mercredis et les longues fins de semaine. Ce condo entièrement meublé dispose d'une chambre avec lit queen et un canapé-lit queen dans la salle familiale. Il a une cuisine complète avec tous les appareils, grand réfrigérateur, micro-ondes, grille-pain, lave-vaisselle, machine à café, Mixer / meuleuse, toute la gamme de cuisson de taille avec four, vaisselle et casseroles, etc. Laveuse sécheuse est dans l'unité. Flat panel TV LCD dans la chambre et la salle avant. 220 chaîne de télévision par câble et d'Internet dans l'unité. Regarder le lever du soleil et de vagues de l'océan à partir de votre propre grand balcon. Marche pour la coquille plage, promenade et un concert en 1 minute. L'unité est au troisième étage et le complexe dispose d'ascenseur. Nous avons Lits matelas dans le cas où vous en avez besoin. Draps, serviettes sont dans l'unité. Le petit-déjeuner et le restaurant Ashworth by Ocean se trouvent à 30 secondes de marche. 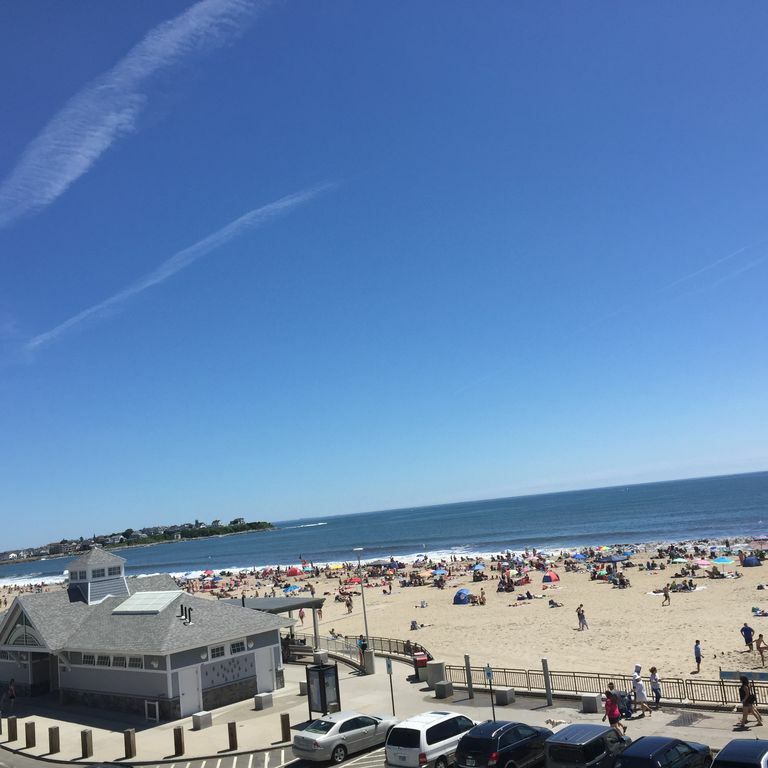 Perfect location on Hampton Beach, private parking, great balcony for viewing waves and fireworks. The condo was clean, comfortable and had everything we needed. The balcony was incredible and overlooked the ocean. We saw the sunrise daily and sat and listened to the waves every evening. Right in the middle of everything, we walked everywhere and the parking spot offered was incredible so we didn't have to worry about parking. Nice mexican restaurant literally right below you - great food. Bagels very closey by. We also cooked most of our dinner meals so it was perfect. The fireworks were right outside and we had the best seat in the house from the balcony. Good communication! Highly recommended to stay here! Thanks Kaila, I appreciate your feed back. The comments and suggestions keeps us improving. We had a wonderful stay. Views from the balcony were spectacular. So peaceful. The unit had everything we needed, was comfortable and clean. Thanks Maureen. It was pleasure to have you. We appreciate your feedback. See you in future. The apartment is beautiful, the location perfect. We loved sitting in the ocean breeze on the balcony. Sheena is a delight to deal with, very accommodating and quick to respond. She had many little items there to make our stay perfect which you don't always find at vacation rentals, like dishwashing and laundry soap, toilet paper, tissues and kitchen garbage bags. The folder with brochures on things to do, restaurant menus, and the tide charts was very helpful as well. She's a great host. Thank you, Sheena! Thanks Donna. We appreciate your feedback. I am glad you had a good time here. great location ...low marks for cleanliness,Could’ve been much better. The first day we got there the condominium seemed to be clean but, in walking around our feet were black our socks black. when I approached via text the management /owner, they admitted they knew there was a issue but were uncertain other take care of it. we washed the floors several times and once they were clean they stayed that way. again the location was close to the beach and the fireworks were across the street . just bring cleaning supplies and you will be fine. Clean, beautiful, exactly like pictures if not better. Was here for 13 weeks for work, had a great stay. Location was great, owners were more than accommodating, they made our stay very seamless. Would definitely use this property again. Please bring money order or bank certified check in favor of Shahina Desai for amount due or cash when checking in unit.No Smoking in Unit and NO PETS. One Parking space allowed. Please do not disturb the residences of the complex. Quiet hours after 11 PM. The towels bed sheets are provided. No Daily Service unless requested. $ 35 per service. You will be checking in at Regal Inn 162 Ashworth Ave Hampton which is 0.5 mile from rental unit. Check in at 3 PM, however if you can come after 12 pm park at Regal and come back after 3 PM to pick up keys for unit. The rest of the information will be provided at Regal.